Tommie Smith (center) and John Carlos performed a Black Power salute at the 1968 Summer Olympics in Mexico City. Sometimes in history, gems are hidden in the questions not asked. For 48 years, Tommie Smith has talked about the night he stood on the podium at the 1968 Summer Olympics, fist thrust skyward. He had won the 200-meter sprint at the Mexico City Games, while his U.S. teammate John Carlos had taken bronze. As the national anthem played, the two African-American athletes each raised a clenched fist, covered with a black glove, as a statement against racial discrimination and for human rights. The iconic protest came to define Smith and Carlos. And so it's no surprise that many journalists — myself among them — sought out Smith recently to discuss Colin Kaepernick's national anthem protests. As my interview with Smith ended, though, I realized I had never heard Smith talk about the race he won in Mexico City. He was, after all, an elite athlete before he became an athlete activist. So I asked him. And Tommie Smith answered with a question of his own. "You know the great Usain Bolt, right?" he said, "Did you know his time of 19.78 [Bolt's winning time in the 200 meters at last month's Rio Olympics], was the same time I ran in Mexico City before they changed it to 19.83?" The record books show Tommie Smith won the men's 200 meters in a time of 19.83. It was blazing fast — a world record at the time — and Smith became the first man to run the 200 in under 20 seconds. But nearly half a century later, he still wonders what happened to those 5 hundredths of a second. "When I crossed the finish line, I saw 19.78," Smith says. "And it [the time posted in the stadium] stayed lit! And when they made the announcement, 'Tommie Smith, first time under 20 seconds, 19.83,' I was disappointed!" As he headed for the victory stand, he had to put aside the disappointment, of course. Tommie Smith, with his black glove at the ready, had a date with sports destiny. Afterwards, he says he still felt the twinge of regret about his time. "But who was a I gonna yell [at]? I had already come off the victory stand. I mean, gee whiz. Enough is enough!" I joked with him that, yes, probably it was best at that moment not to cause any more trouble. "Yeah," Smith laughed, adding, "and you're the first person I told because you're the first person to ask about the race in that context." Smith doesn't know why the time changed as much as it did. Neither does Olympic historian David Wallechinsky. Wallechinsky notes times on the in-stadium clock often are adjusted after races, but usually by a hundredth of a second, or so. Not 5 hundredths. "That's three good strides," Smith says. Wallechinsky says perhaps 1968 technology was to blame. Whatever the reason, Smith loves the fact that his 19.78 links him to Usain Bolt. There's no doubt in anyone's mind Bolt is the greatest sprinter ever. But Tommie Smith is happy to remind you about how great he was, 48 years ago. If you happen to ask. And it's time for sports. SIMON: Colin Kaepernick took a knee as a naval officer sang "The Star-Spangled Banner" before Thursday's game in San Diego. Boos burst in the air. NPR's Tom Goldman has followed the Kaepernick story and joins us. Tom, thanks so much for being with us. TOM GOLDMAN, BYLINE: My pleasure, Scott. SIMON: Now, taking a knee, as opposed to just sitting out the national anthem, strikes me - whether you agree with it or not - is a deliberate statement as somebody who wants to show respect, even humility, but not reflexive obedience to the national anthem. How has the Kaepernick protest symbolism evolved since last Sunday? GOLDMAN: Well, one of the ways is what you mention. He says he and his teammate Eric Reid, who joined him in the protests in San Diego, decided taking a knee would be more respectful than sitting. He's also spoken strongly about supporting the military. That was a big thing Thursday night in San Diego, a city that has a huge military population. And Kaepernick seems to understand the protest is more credible if he does more than sit out anthems. He says he's doing that. He says he's working with charities that serve the oppressed people. Kaepernick says they're at the heart of this protest. And he says he'll donate a million dollars to those types of charities. So if you're a person who was initially offended by his actions but you paid attention and were open to what he did and said as the week went on, he might seem like a more sympathetic figure today. SIMON: There's been a lot of criticism but also a lot of support, hasn't there? GOLDMAN: Yeah there are supporters, including active military and veterans. Some say they don't like his method. But they defend his right to protest. Others are OK with questioning just what the anthem and the flag stand for. But there are, as you say, lots of critics, too. A number of police organizations feel insulted by Kaepernick's strong words about police brutality. In fact, the Santa Clara Police, who normally work 49ers home games, are threatening to boycott those games unless the team, quote, "takes action against Kaepernick." SIMON: Tom, in a report in the Kaepernick story this week, you happened to speak to Tommie Smith. Now, he's the Olympic runner who famously raised his fist as a symbol of black power at the 1968 Olympics in Mexico City. He told you a story I have never had before. GOLDMAN: (Laughter) I hadn't either. 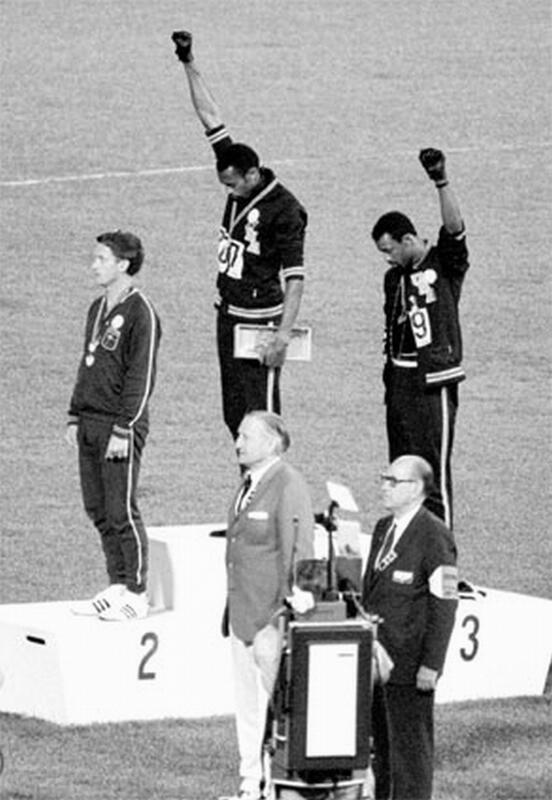 You know, that raised fist, Scott, along with American teammate John Carlos, is perhaps the most iconic sports protest ever. For most, it's what defines Smith and Carlos. And people almost forget they were great athletes, too. I mean, Smith, in particular, was blazing fast in the Mexico City 200-meters. It landed him on top of that controversial victory stand with the gold medal around his neck. So yeah, I interviewed him about Colin Kaepernick but also asked him about the race. And he got so animated, you know, not just remembering the victory but how he says he got robbed by five-hundredths of a second. His official winning time was 19.83 seconds. That was a world record. He was the first man to break 20 seconds in the 200 - a great accomplishment. But Smith is a true competitor before he was an iconic activist. And he still burns a bit because he says he ran faster than 19.83. Here's a bit of our conversation. TOMMIE SMITH: When I crossed the finish, I saw 19.78. And it stayed lit. It stayed lit. I said, oh, man. Smith, you were pretty fast. I'm talking to myself back then. I can tell you now. And when they made the announcement - Tommie Smith - roar (ph) - first time under 20 seconds - 19.83. I was disappointed. (Laughter) But who was I to yell? I had already come off the victory stand. So, I mean, gee whiz. Enough is enough. GOLDMAN: You weren't going to cause any more trouble, right? SMITH: And you're the first person I told this because you're the first person to ask about the race in that context. SIMON: Now does this remind you, Tom - Tommie Smith wasn't just Eldridge Cleaver in track shoes. SIMON: I mean, this guy was a jock. He was one of the best runners of his time. And he wanted that record. SIMON: Any idea why the time was changed? GOLDMAN: You know, he doesn't know. Neither does prominent Olympic historian David Wallechinsky. Wallechinsky noted times on the field clock, often, are a little different from the official times. But usually, it's around a hundredth of a second or so but not 500. So maybe it was the technology back in 1968. But whatever the reason, Tommie Smith loves the fact that the clock did say 19.78. Usain Bolt won the 200-meters in Rio last month in that exact time. There's no doubt in anyone's mind Bolt is the greatest. But it shows how great Smith was 48 years ago. SIMON: NPR's Tom Goldman, thanks so much. SIMON: And tomorrow on WEEKEND EDITION SUNDAY, how the national anthem became a symbol at games. Transcript provided by NPR, Copyright NPR.